We’ll admit it: at Vearsa we are always pointing out the silver linings in what many see as a cloudy industry. We’re very protective of our place in the market—which is not to say that we are in any way delusional! We simply like to focus on solutions rather than problems. And we are sometimes perplexed by the range of headlines out there and the stories they tell. A recent example is the doubtless valid article from PW announcing the lowest monthly eBook sales in years: “Within adult trade…e-book sales fell 4.9%” (“Mixed January for Trade Sales”). GalleyCat followed suit with the headline “eBook Sales Down 10.2% in January 2015.” Both articles were based on the latest StatShot figures from The Association of American Publishers, representing 1,120 publishers. 1) Pluses and Minuses/Winners and Losers. There are winners and losers in among the stats. But in our case the winners outweigh the losers. Of our representative set of publishers, 52% experienced a drop in earnings while 48% experienced an increase. However it was the magnitude of the increases that gave us our strong result. Those who experienced a rise in earnings saw an accumulated increase of 84% in revenue, while those who saw a decrease had a drop of 33%. So in our case the good news outweighed the bad. (Silver lining!). Our publishers are spread across Europe, the US, and Asia, so we can get a good regional view of what is happening in the market. The two heavyweights of the UK and the US both increased significantly (27% and 47% respectively). But the US growth was more strategic than organic when it came to our publishers. Other interesting growth figures include 70% for Australia and 35% for Ireland. Similar to that of our AAP colleagues, our data also reflected a drop off in Juvenile Fiction (-10%). But this was more than offset by a doubling of our Adult Fiction sales. 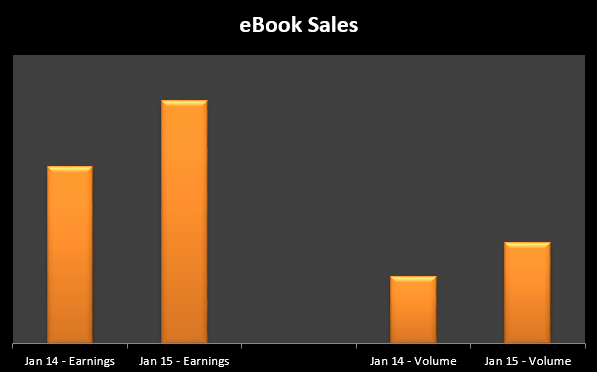 Again, there is a strategic element at work here as our publishers continue to add to their eBook lists. But this fact shows that conversion costs can be worth it when building on the momentum of a strategic digital plan. 4) Subscribe to the future. This fact is going to be just that: a fact. In January 2014, subscription sales added a negligible amount to overall revenue. In January 2015 they added almost 20% to US sales for this representative set of publishers (including non-US based). Life is a journey . . . and so is the eBook story. Our CEO put this journey in context in his recent DBW blog “Publishing’s Digital Disruption Hasn’t Even Started." And we here at Vearsa are sharing that journey with our publishers. From the highs of August 2014 . . . to the blips that will no doubt crop up along the way. We will need the ABCs of Adaptability, Bravery and Creativity to continue to grow in this fast-changing marketplace. (I sense another blog post coming! ).